This year, one of my New Year resolutions is to save money by conserving energy. I came across a really cool and informative blog called Engin, which basically talks about everything energy-related. For instance, did you know that recycling one glass container saves enough energy to light a 100-watt bulb for four hours? Were you also aware that recycled paper saves 60 percent energy versus virgin paper? Worry not if you were unaware of these simple fun facts for I too was totally clueless until today! 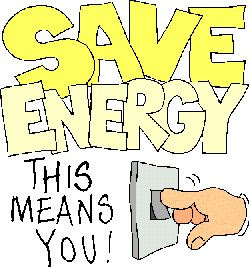 Energy conservation is beneficial in a number of ways. Aside from increasing financial capital, environmental value, national and personal security as well as human comfort; conserving energy will also help you SAVE! By the way, our electricity bill last month amounted to almost RM500, which almost gave me a heart attack! The high amount really threw me off course; scaring me into immediate panic mode so energy conservation is currently top priority on my resolution list. Anyway, it's about time B and I did more to save energy. We tend to have unnecessary lights on even though nobody is inside the room. And sometimes, we'd have the TV blaring outside in the living-room but both of us would be inside my home-office. I'd be working on my stuff and B happily surfing on his MacBook. I guess it's just out of habit and sheer forgetfulness that we sometimes overlook these small things. But they do add up and it's a waste of our hard-earned money so it has to stop! I did a little online research and came up with several easy ways to help us conserve energy and hopefully save every month. I hope they come in handy for you as well! 1. Ensure your appliances are switched off or unplugged after using. 2. Reduce the amount of waste you produce. Buy minimally packaged goods, choose reusable products over disposable ones, and most importantly - RECYCLE. 3. Use less hot water by installing low-flow shower heads. 4. Clean or replace air filters when needed. Energy is lost when air conditioners have to work harder to draw air through dirty filters. 5. Buy energy-efficient fluorescent bulbs, which may cost more but will definitely save money in the long run by using less energy whilst lasting 8-12 times longer. Great points about saving energy and money. It has been a problem for me at times as well in keeping the costs under control. need to save money too and every way we can save it's worth a try! That's a great tip. Sometimes I have this sudden urge to be environmental-friendly (but only short bursts urges) and keep telling myself to save energy, save everything. *Sigh* If only the people around me can do the same too, it'd be easier for me to practice this..
Good topic. In fact, there is a problem with my TNB Meter. Only a few days ago I visited Marang TNB office requesting them to check and change the meter. For the past months I've been paying around RM200.00+ per month for my electricity bill. I hardly use my air-conditioning units, instead I frequently use fans, but you know I am staying, I will only switch on the fan at the place I station. Most of my lightings are energy saving. Fridge, everybody have it, washing maching, everybody have it, imagine I'm staying alone. There is something wrong with the meter, it is running so fast. So Marzie, if your bill is high go check the meter, see whether it is running too fast. we have to conserve our resources or else we are the one will be affected in the end. thanks for the tips. Yeah, my electricity bills are somewhere around rm220 - rm300 per month. Need to save here and there. Phillips 11w sure cost like rm11-18 than the typical rm2.50 normal bulp, but it does only use 11w . except when i am alone..
My modem suddenly stopped working and I have been offline a little more than a week. I am sitting at the public library trying to catch up. If you had your ad on my widget during the 11th to the 15th of January, please let me know in a comment, and I will give you an extra thank-you-link.